The Indian-American community, having the highest per capita income among the ethnic communities in the US, appears to have opened up its wallet for the Obama Campaign, but its contribution is far less than that of 2008. In one of the most brazen attacks against Americans in recent years, a suicide bomber rammed his explosives-laden car into a US Consulate vehicle in Peshawar today, killing three persons and wounding 19 others, including two US nationals. 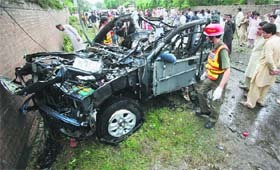 A rescue worker surveys a damaged vehicle after it was hit by a bomb in Peshawar. The new head of the Red Cross will urge Syrian President Bashar al-Assad to improve humanitarian access to civilians in the war-torn country during a visit to Syria that begins on Monday, the aid agency said. 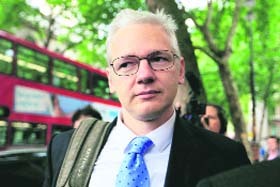 Seeking to resume talks with Ecuador, Britain today reassured WikiLeaks founder Julian Assange and the Latin American country over the perceived risk to his human rights if he were to be extradited to Sweden to face allegations of sexual offences. British Foreign Secretary William Hague said the apprehension that Julian Assange may be extradited again from Sweden to a third country were unfounded given Sweden’s commitments to human rights and the fact that UK's consent would be needed if the onward extradition were to be sought. A young Christian girl arrested on a blasphemy charge that has sparked an international outcry will remain in a high-security jail till at least Friday as the court hearing her case was adjourned today. The Mitt Romney campaign, which last week at Republican National Convention wooed the community by inviting a record number of Indian-Americans to address the event, does not appear to have been successful in getting a pie into the Indian-American money bag, the list of major Romney donors available from open source documents indicate. Florida-based Dr Akshay Desai appears to be the only Indian-American to have raised more than $1 million for the Romney campaign, which unlike the Obama Campaign, has remained very secretive in revealing the list of its major donors. Desai has been named as Romney's "stars and stripes" - the small group of top fund raiser for the campaign. He is also the only Indian-American serving on the Romney national finance team. In fact, he was also a Romney bundler (major fund raiser) in his previous presidential bid in 2008. "Republican Party donor base at all levels is very motivated and energised. I am very confident that we will out raise President Obama in the month of August and every month leading up to November election. We will match and surpass Obama's goal to have raised $1billion. We are confident that we will have resources to get our voice out to the public and win the election on strength of our ideas," Desai told PTI. If Desai is the only major Indian-American donor for the Romney campaign, the list of bundlers made public by the Obama campaign names nearly half a dozen who have raised between half a million to one million US dollars. Major Indian-American bundlers as released by the Obama Campaign are Rajiv Fernando (Chicago), Shefali Razdan Duggal (San Francisco), Reshma Saujani (New York), Raj Goyle (New York), Kamil Hasan (Saratoga in California) and Ajita Razi (California). "I am quite confident that President Obama will be re-elected in November. As became crystal clear at the Republican National Convention last week, the Romney/Ryan ticket is focused on resurrecting the failed policies of the Bush Administration," Shefali Razdan Duggal said. The Obama campaign has listed her among $500,000 to $1 million category. "The US electorate is well aware of the cost that the US economy continues to pay from the policies of greed and trickle down economics that always seem to only trickle up to the rich. Of course, by promising to reward the wealthy, Romney has been able to tap them to build a fundraising lead. In the end, it will be votes and not dollars that win the election," Duggal said. Interestingly, none of the Obama bundlers in 2008 elections figure in the list this time. While Vinai K Thummalapally from Colorado and Deven Parekh from New York had raised more than $100,000 in 2008; Karim Alibhai (Florida), Jatinder Bedi, Sunil Puri and Balvinder Singh - all from Illinois - had raised more than $50,000. Also except for Kamil Hasan from California, none of the 2008 bundlers of Hillary Clinton figure among the Obama bundlers this time. The two Americans wounded in the attack along with two Pakistani employees of the Consulate apparently escaped by whiskers as they were travelling in an armoured SUV. The bomber slammed his car, laden with 110 kg of explosives into the Consulate vehicle, minutes after it had left the heavily guarded and fortified Consulate building and was passing a UNHCR guest house on Aabdara Road in Peshawar, the capital of Khyber-Pakhtunkhwa province. So massive was the impact of the collision of the bomb-laden car that it reverberated for miles around. Eyewitnesses who included policemen accompanying the Consulate car as escorts said a thick plume of smoke rose over the sky and the blast left a crater five-feet- wide on the road. "The Americans were travelling in an armoured SUV and survived the attack," police officials said. An American back-up vehicle immediately rushed the wounded Americans to the Consulate. The police said the death toll could rise as many of the injured were in critical condition. There were conflicting reports about whether there were any American casualties. Initially, provincial Information Minister Mian Iftikhar Hussain had said two Americans were killed in the attack, but the US Embassy denied that any Americans were among the dead. A statement issued by the US State Department confirmed that a vehicle of the US Consulate was hit in the terrorist attack. "Two US personnel and two Pakistani staff of the Consulate were injured and are receiving medical treatment. No US Consulate personnel were killed," the statement said. 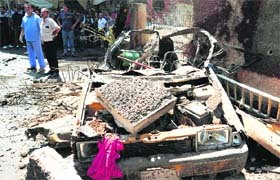 TV footage showed the blast left the vehicle smouldering. Police later recovered half-burnt US passport from the car. Officials at the Khyber Teaching Hospital said they had received two bodies and 19 injured. The sucide bomber was also killed. Two women, two children and a policeman were among the injured. The UN also issued a statement, saying all employees of the UNHCR were safe. No group claimed responsibility for the attack though such incidents are usually blamed on the Pakistani Taliban. The US Consulate in Peshawar and its personnel have been targeted several times in the past by terrorists. In May last year, a remote-controlled car bomb targeted a convoy of US Consulate vehicles, killing one person and injuring 11. The Taliban claimed responsibility for that attack. In April 2010, three explosions went off in rapid succession near the Consulate. Peter Maurer said he would also continue efforts to gain access for his agency to Syria's detention centres, which rights groups say hold tens of thousands of people rounded up during the 17-month-old conflict, including teenagers. "At a time when more and more civilians are being exposed to extreme violence, it is of the utmost importance that we and the Syrian Arab Red Crescent succeed in significantly scaling up our humanitarian response," he said in a statement. "An adequate humanitarian response is required to keep pace with needs, which have been growing exponentially," added Maurer, who took over as president of the independent organisation from Jakob Kellenberger on July 1. The International Committee of the Red Cross (ICRC) has 50 foreign and Syrian aid workers in Syria, but all have been confined to Damascus since late July due to heavy fighting in what it has said has become an internal armed conflict, or civil war in layman's terms. The agency was not able to send out any aid convoys for more than two weeks, but did manage late last week to send some food rations and other relief supplies to rural Damascus and Homs for distribution by the Syrian Arab Red Crescent, the ICRC said. Foreign secretary William Hague said in a statement in parliament that the apprehension that 40-year-old Assange may be extradited again from Sweden to a third country were unfounded given Sweden's commitments to human rights and the fact that UK's consent would be needed if the onward extradition were to be sought. Stating that Britain wanted to "continue our dialogue with the Government of Ecuador", Hague said that the Foreign Office had invited the Government of Ecuador to resume discussion, as early as possible, on this issue. Since July 19, Assange has been holed up in the Ecuador embassy here. The Latin American country granted Assange "diplomatic asylum" on August 16, a category of asylum Britain does not recognise. Assange had been fighting for a year and a half against being sent to Sweden for questioning about accusations of sexual abuse. Judge Muhammad Azam Khan adjourned the case until September 7 because of a lawyers' strike today. The adjournment followed a request from the lawyer of Malik Ammad, the man who filed the complaint against Rimsha Masih. Rimsha has been held at Adiala Jail in Rawalpindi after she was arrested from the low-income Mehria Jaffar area on the outskirts of Islamabad on August 16. She was accused of burning pages of a primer used to teach children the Quran and was booked by police under the harsh blasphemy law. However, in a twist in the case, police on Saturday arrested Khalid Chishti, the imam of the mosque in Rimsha's neighbourhood, after his deputy told police that the cleric had stuffed pages of a holy book into the girl's shopping bag to implicate her in the matter. Chishti's deputy Hafiz Zubair and two other men told a magistrate the cleric added pages to burnt pages and ashes brought to him by another man.